School Funding Rally At City Hall… Honoring Connie…….Political Calendar.. Proponents of more local and state investment in public education will rally at 6 p.m. today (May 22) before the regularly scheduled Common Council meeting at New Britain City Hall. 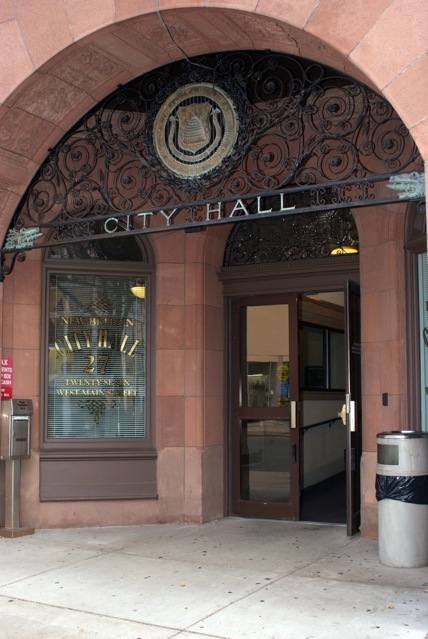 The New Britain Common Council is moving toward adoption of a municipal budget in early June for the next fiscal year that begins on July 1st. Mayor O’Brien is proposing an infusion of new funding this year to address more than a decade of minimum or flat funding by increasing the $118 million schools’ budget to closer to $141 million by using increases in local and state funds and bonding. Connie Wilson Collins, who died last January, will get official city recognition Wednesday, May 22nd, when a portrait of the former city alderwoman and Democratic Town Committee leader will be unveiled in the Common Council chambers at New Britain City Hall. Collins was the first African-American elected to public office in the city. 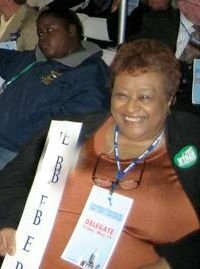 Connie Wilson Collins in 2006 at the Democratic State Convention. At an Opportunities Industrialization Center (OIC) awards reception last week Collins was remembered by political and labor friends and associates including former State Senator Joe Harper, former Mayor William McNamara and her longtime friend Emma Pierce, who received the community service award named for Collins. Alderman David DeFronzo and DAS Commissioner Don DeFronzo emceed the event held at the OIC on North Street. Collins served for three terms on the Common Council during the (William) McNamara administration where she led a drive to re-name Hartford Avenue to Martin Luther King, Jr. Drive. Along with Emma Pierce, she co-founded the OIC and rose to lead the national OIC organization. Connie’s longtime service to her city began in organized labor. She became the first union president (United Electrical Workers of America Local 207) at Landers, Frary and Clark, later known as General Electric in New Britain. She went on to work at the United Labor Agency and serve on numerous boards and organizations, in addition to building the OIC into an effective employment and youth development agency. On the Town Committee and throughout her life Collins won praise and respect for her skills and efforts as a coalition builder, negotiator and advocate for social justice. The unveiling of Collins’ portrait at the Council Chambers will be a poignant moment for city Democrats, including Connie’s daughter, Tonilynn Collins, who represents Ward 2 on the Common Council. This entry was posted in City Hall, Education, Meeting/Event, Municipal Budget. Bookmark the permalink. 1 Response to School Funding Rally At City Hall… Honoring Connie…….Political Calendar.. The bonding of education is one of the most dangerous an ill-thought concepts ever developed by any mayor in the history of this great City! This shows an entire disregard for future generations, a complete ignorant lack of finance, budgeting understanding. How can you support such outlandish lack of fiscal responsibility? Same on you all.